Awhile back, I posted a recipe for Cumin Dusted Pork Chops and mentioned this Southwestern Protein Mix. 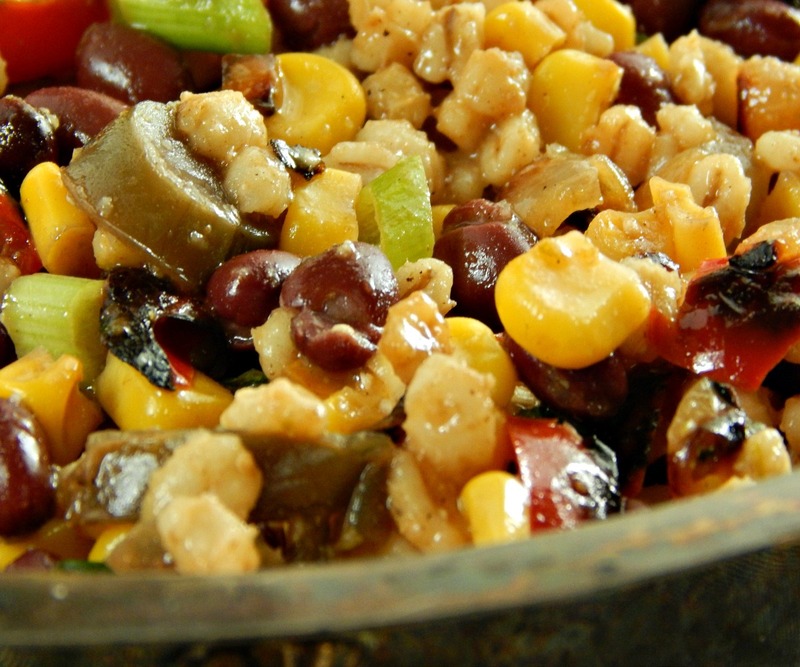 A wonderful medley of corn, bell peppers, black beans and barley, this flavorful dish would be a fantastic side for any number of meals. I know what you’re thinking! I just want to get dinner on the table and grains take “fuh evah” to cook! That’s why I cook up larger batches of long cooking grains and beans and freeze them in small portions. And sometimes I use my pressure cooker to speed things along, too. As far as the grain goes, just about any grain will do. I really like the way barley just soaks up all the flavor and gives a wonderful chewiness to the mix. I think Barley is often overlooked and passed by for some of the trendier (and more expensive grains.) After all, people and their animals have lived on barley for centuries. Fresh corn is great in this, and this dish is a wonderful way to use any leftover sweet corn. And if you have any this dish leftover? Feel free to throw it into a packet and freeze for an even quicker side later on. After you warm it, add a squeeze of fresh lime for super fresh flavor. Heat oil in a large skillet. Add onion, bell pepper and jalapeno and cook until softened. Add garlic and cook for a moment longer. If your corn hasn’t been cooked, add to the skillet and saute, stirring now and then until it has been cooked to desired doneness, three to four minutes. If your corn is already cooked, just add it in and then go ahead with the beans & barley. Add the beans and barley and heat through. Add cumin, salt and pepper to taste. Squeeze with half the lime. Serve with the rest of the lime at the table. This entry was posted in Click here for Fabulous Food Posts and tagged Barley, Beans, black beans, Corn, Frugal Hausfrau, Legumes & Pulses, Mexican or Southwestern, Vegetable Side. Bookmark the permalink. My kind of protein Mollie…Looks yummy! Oh I could face-plant into this! lol! I think it would make a great side for something barbecued, too. /Like those ribs – I’m still seeing them in my mind’s eye! Love all the delicious vegetables and spices in this southwestern protein mix, Mollie. Those barley grains must have surely absorbed all the goodness that the veggies offered. The colors and taste would sure be a great addition to any table. Looks absolutely delicious! A perfect compliment to any main dish. Pinned for later! Thanks Sweetie!! I appreciate the pin!! Thanks, Ellen! That’s the best compliment ever!! You have a lovely blog. Great content. Absolutely loved visiting your blog. Thanks, I appreciate it! Everyone should click your blog name and link back! I love your give away! !